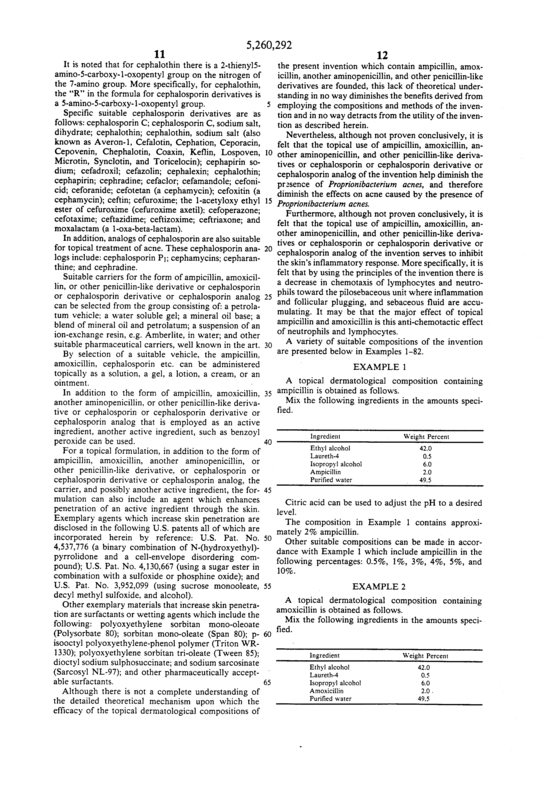 A method and composition for topically treating acne and acneiform dermal disorders includes applying an amount of an antibiotic selected from the group consisting of ampicillin, amoxicillin, other aminopenicillins, and cephalosporin, and derivatives and analogs thereof, effective to treat the acne and acneiform dermal disorders. The antibiotic is blended with a carrier suitable for topical application to dermal tissues. 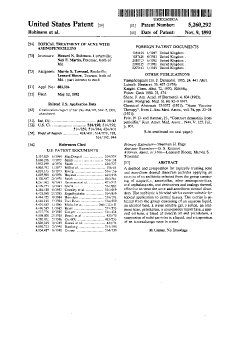 The carrier is selected from the group consisting of an aqueous liquid, an alcohol base, a water soluble gel, a lotion, an ointment base, petrolatum, a nonaqueous liquid base, a mineral oil base, a blend of mineral oil and petrolatum, a suspension of solid particles in a liquid, and a suspension of an ion-exchange resin in water. 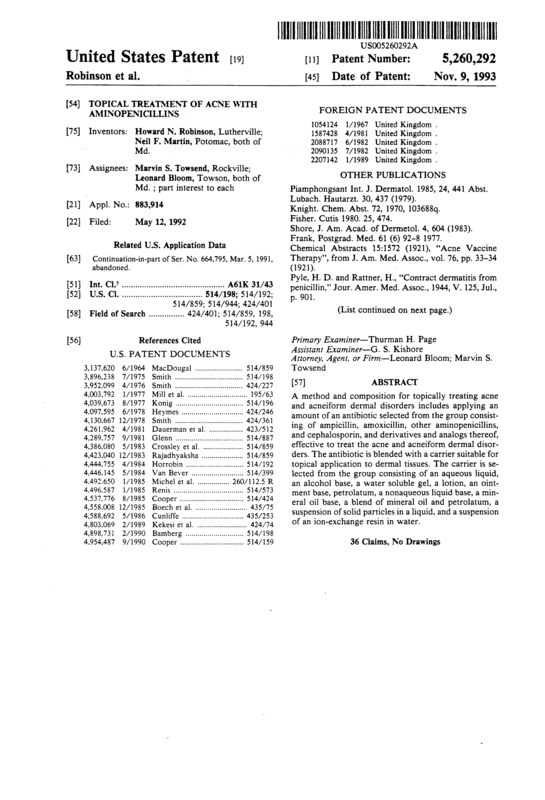 A method of treating a human being for acne vulgaris which comprises administering to the human being an amount of a composition consisting essentially of an aminopenicillin antibiotic active ingredient selected from the group consisting of ampicillin and amoxicillin and a pharmaceutical carrier, applied directly to affected dermal tissues, effective to treat the acne, wherein the carrier includes water and a water-miscible alcohol, wherein a combined weight percent of said water and water-miscible alcohol is in a range spanning 42.2% to 99.5% of the composition. 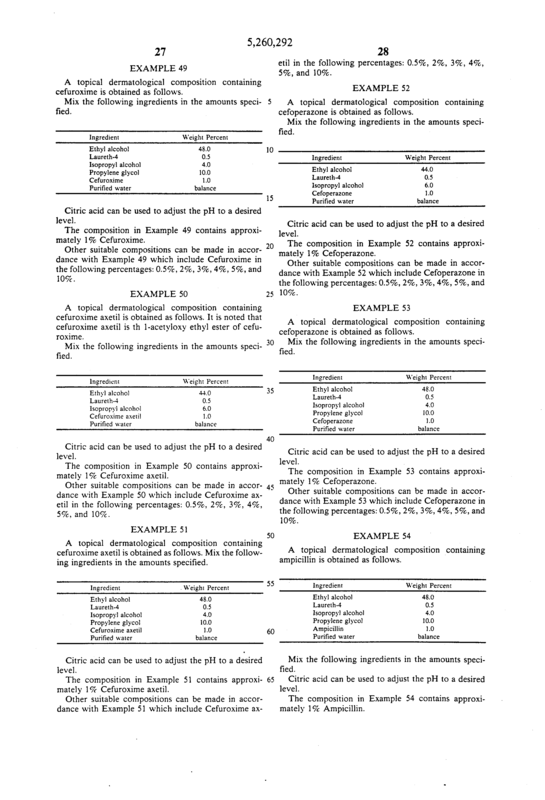 The method described in claim 1 wherein the aminopenicillin antibiotic is selected from the group consisting of ampicillin; ampicillin, monohydrate; ampicillin, potassium salt; ampicillin, sesquihydrate; ampicillin, trihydrate; ampicillin, anhydrous form; ampicillin, sodium salt and ampicillin, D(-)form, L(+)form, or DL-form. 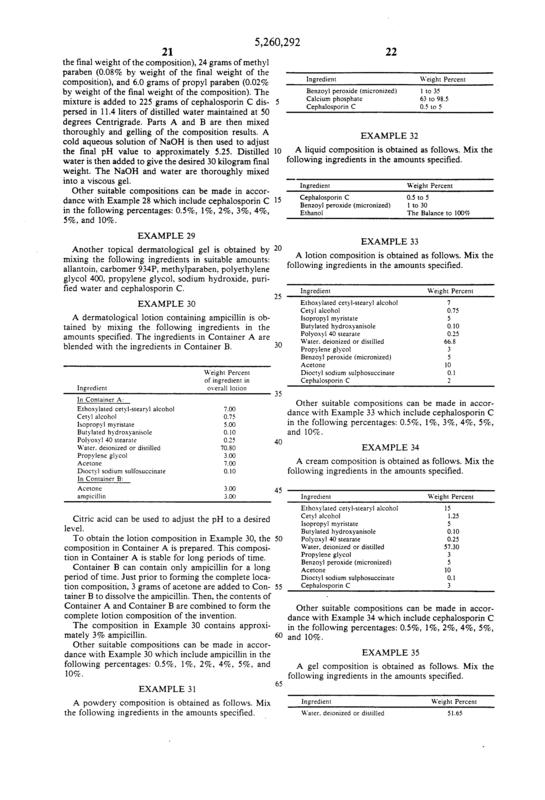 The method described in claim 1 wherein the aminopenicillin antibiotic is selected from the group consisting of amoxicillin; amoxicillin trihydrate; amoxicillin hydrochloride trihydrate and amoxicillin beta-naphthalenesulfonate trihydrate. 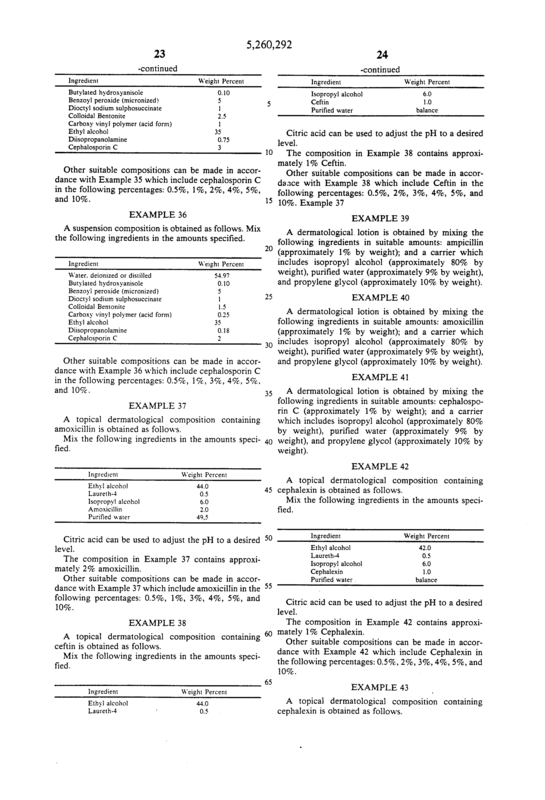 The method described in claim 1 wherein the carrier is present in a weight percent range spanning 73.8% to 99.5%. 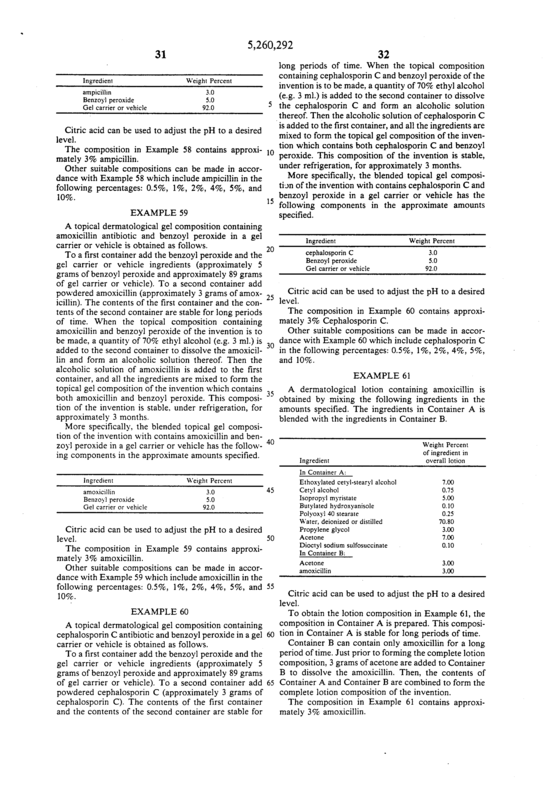 The method described in claim 1 wherein the carrier is present in a weight percent range spanning 42.2% to 99.5% and includes water, ethyl alcohol, and isopropyl alcohol. 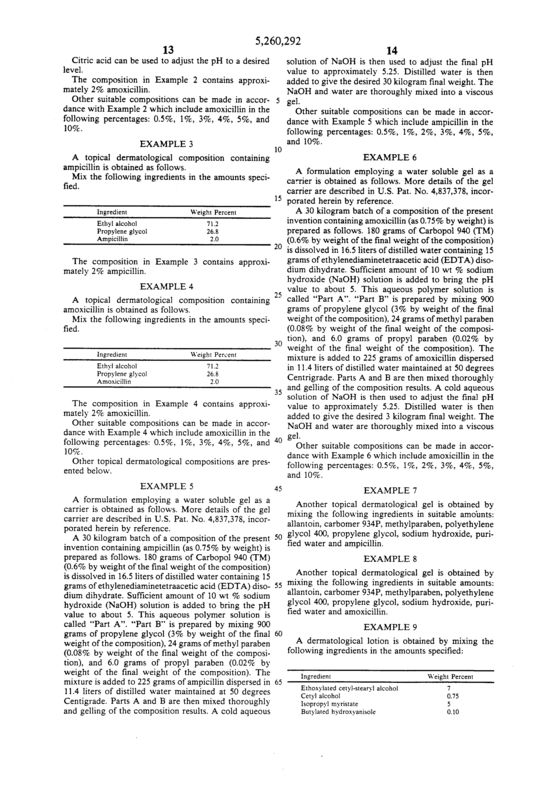 The method described in claim 1 wherein the carrier includes ethyl alcohol in a weight percent range spanning 35% to 98.5%. 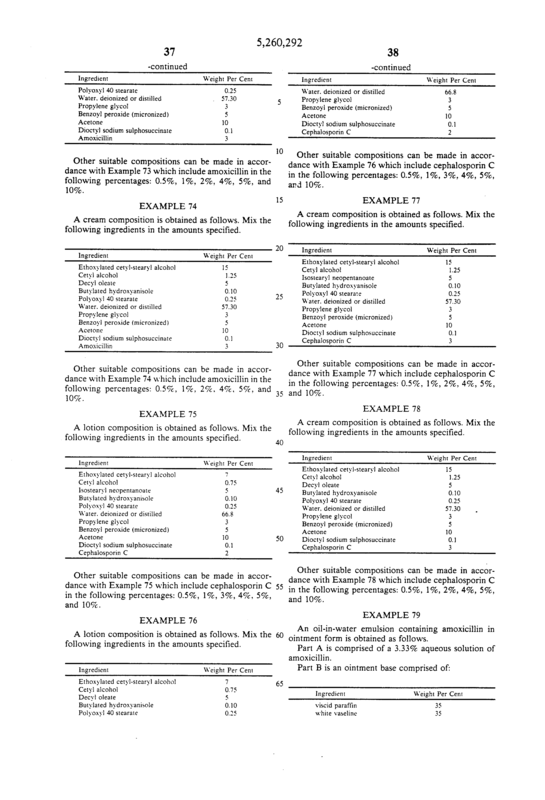 The method described in claim 1 wherein the carrier includes isopropyl alcohol in a weight percent range spanning 4% to 80%. 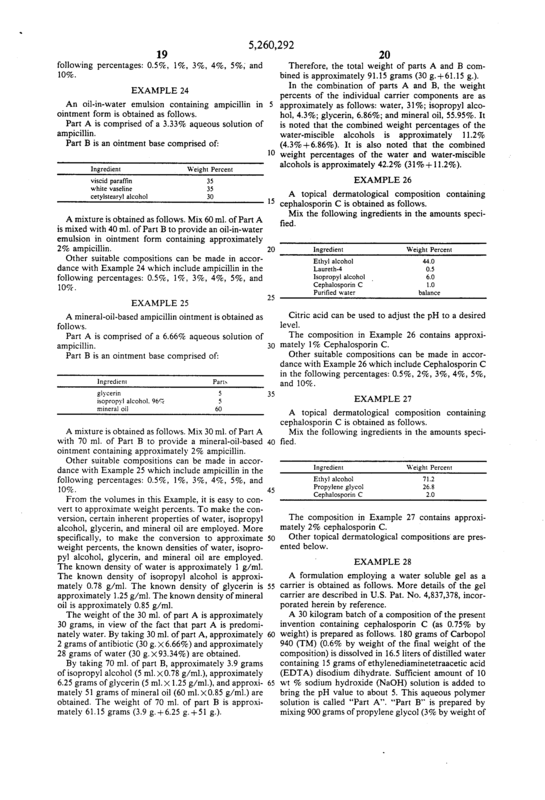 The method described in claim 1 wherein the carrier includes propylene glycol in a weight percent range spanning 3% to 26.8%. 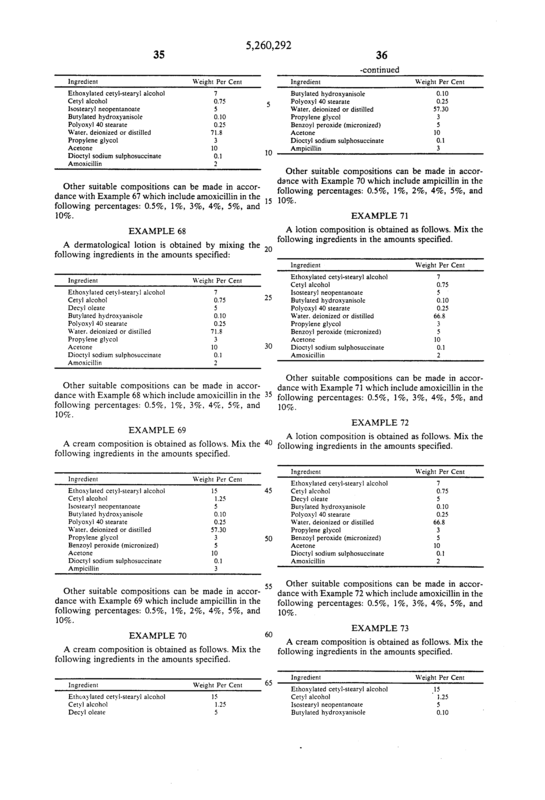 The method described in claim 1 wherein the carrier includes water in a weight percent range spanning 9% to 95%. 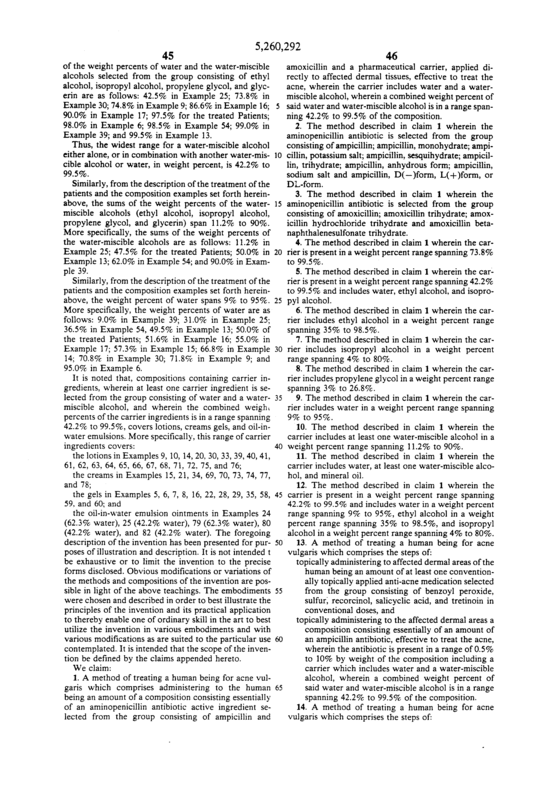 The method described in claim 1 wherein the carrier includes at least one water-miscible alcohol in a weight percent range spanning 11.2% to 90%. The method described in claim 1 wherein the carrier includes water, at least one water-miscible alcohol, and mineral oil. 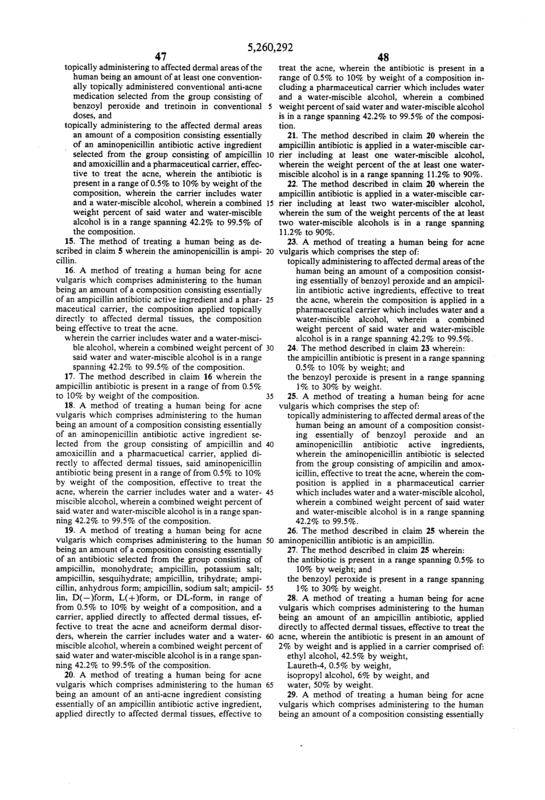 The method described in claim 1 wherein the carrier is present in a weight percent range spanning 42.2% to 99.5% and includes water in a weight percent range spanning 9% to 95%, ethyl alcohol in a weight percent range spanning 35% to 98.5%, and isopropyl alcohol in a weight percent range spanning 4% to 80%. 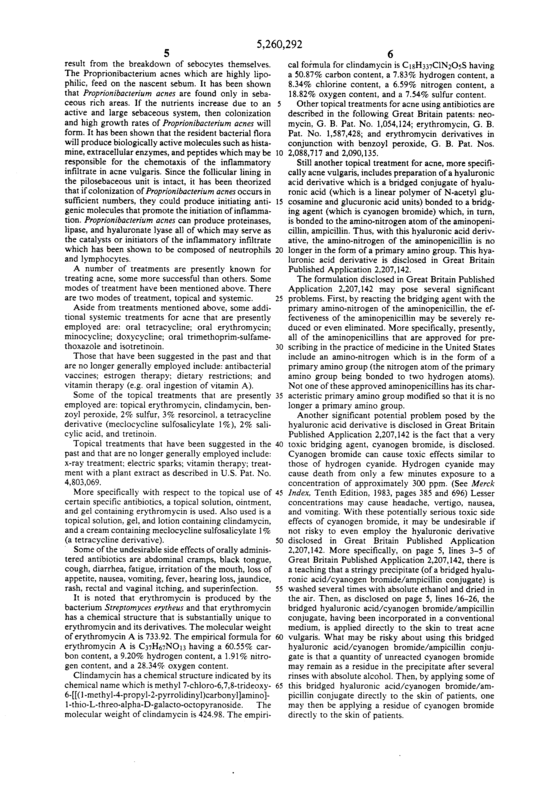 topically administering to the affected dermal areas a composition consisting essentially of an amount of an ampicillin antibiotic, effective to treat the acne, wherein the antibiotic is present in a range of 0.5% to 10% by weight of the composition including a carrier which includes water and a water-miscible alcohol, wherein a combined weight percent of said water and water-miscible alcohol is in a range spanning 42.2% to 99.5% of the composition. 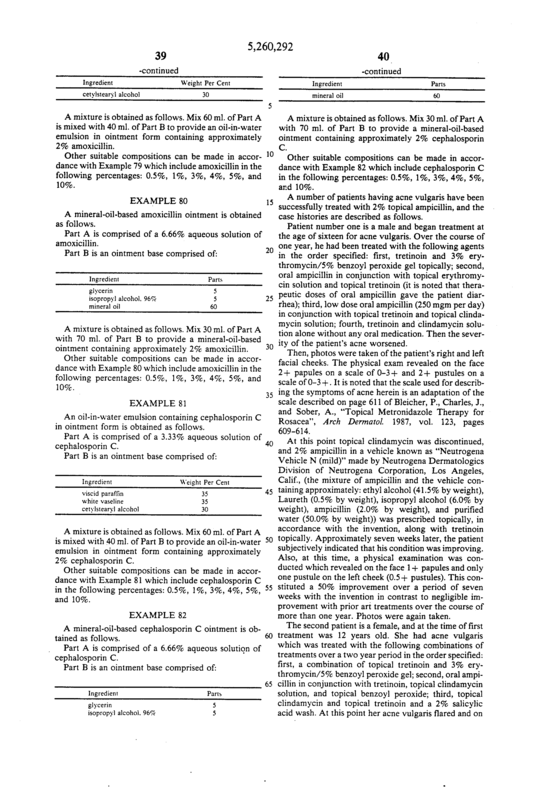 topically administering to the affected dermal areas an amount of a composition consisting essentially of an aminopenicillin antibiotic active ingredient selected from the group consisting of ampicillin and amoxicillin and a pharmaceutical carrier, effective to treat the acne, wherein the antibiotic is present in a range of 0.5% to 10% by weight of the composition, wherein the carrier includes water and a water-miscible alcohol, wherein a combined weight percent of said water and water-miscible alcohol is in a range spanning 42.2% to 99.5% of the composition. 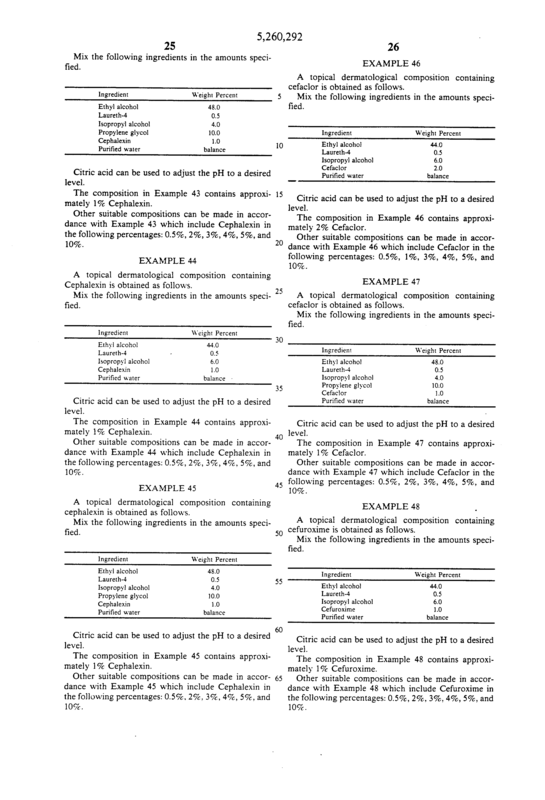 The method of treating a human being as described in claim 5 wherein the aminopenicillin is ampicillin. 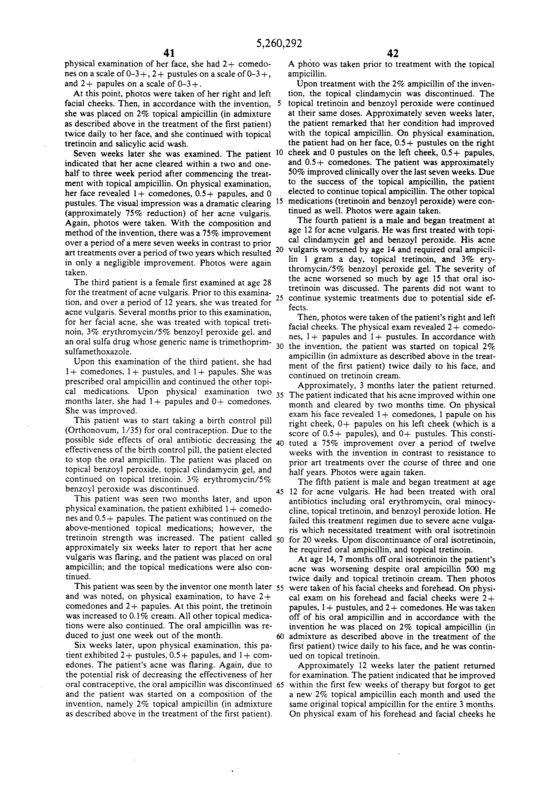 A method of treating a human being for acne vulgaris which comprises administering to the human being an amount of a composition consisting essentially of an ampicillin antibiotic active ingredient and a pharmaceutical carrier, the composition applied topically directly to affected dermal tissues, the composition being effective to treat the acne. 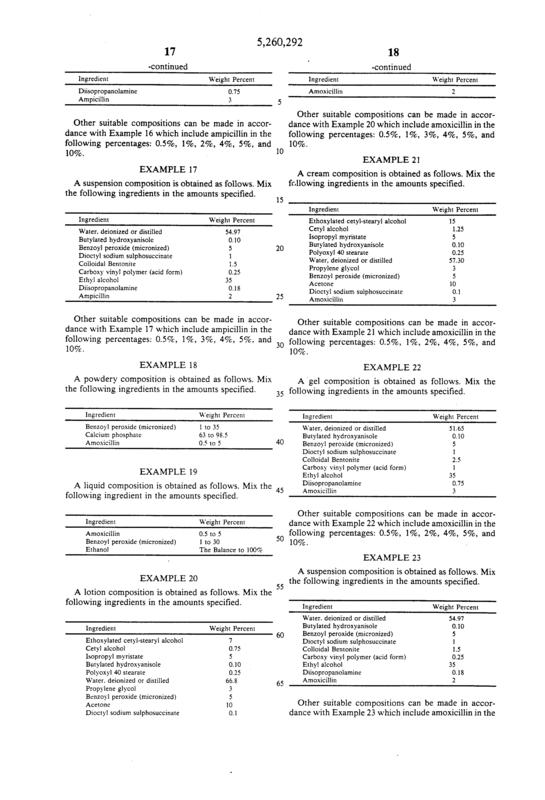 wherein the carrier includes water and a water-miscible alcohol, wherein a combined weight percent of said water and water-miscible alcohol is in a range spanning 42.2% to 99.5% of the composition. 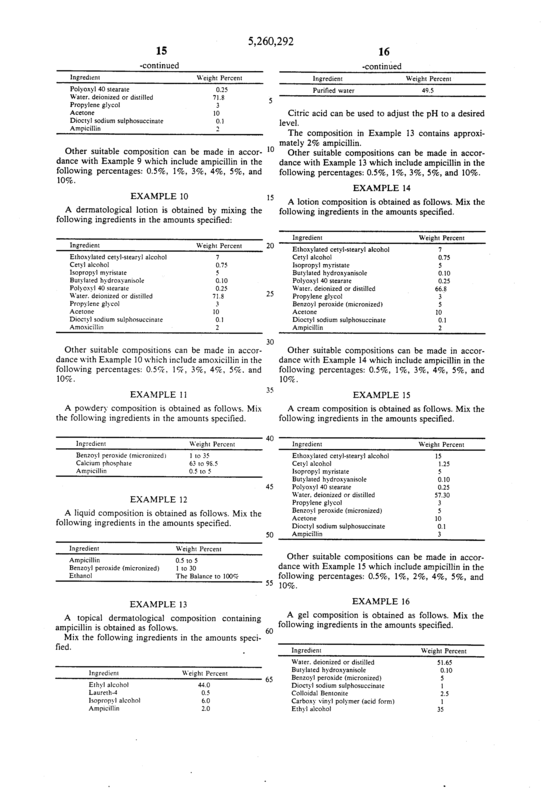 The method described in claim 16 wherein the ampicillin antibiotic is present in a range of from 0.5% to 10% by weight of the composition. 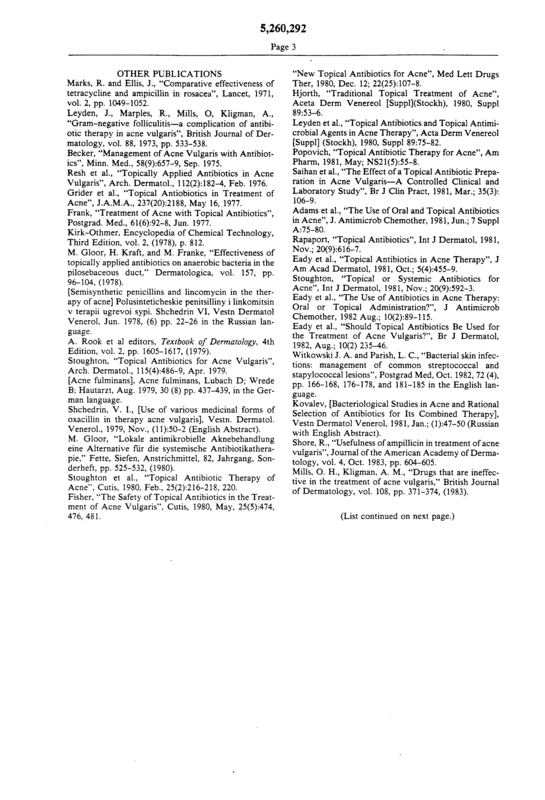 A method of treating a human being for acne vulgaris which comprises administering to the human being an amount of a composition consisting essentially of an aminopenicillin antibiotic active ingredient selected from the group consisting of ampicillin and amoxicillin and a pharmacuetical carrier, applied directly to affected dermal tissues, said aminopenicillin antibiotic being present in a range of from 0.5% to 10% by weight of the composition, effective to treat the acne, wherein the carrier includes water and a water-miscible alcohol, wherein a combined weight percent of said water and water-miscible alcohol is in a range spanning 42.2% to 99.5% of the composition. 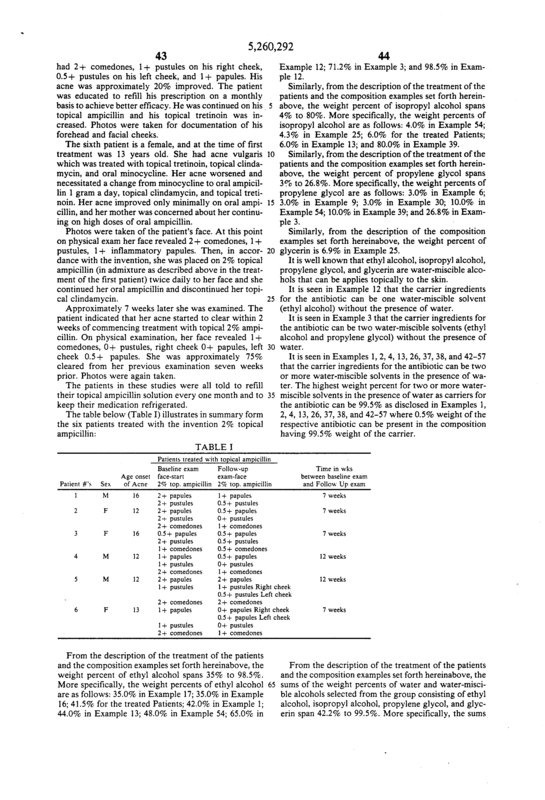 A method of treating a human being for acne vulgaris which comprises administering to the human being an amount of a composition consisting essentially of an antibiotic selected from the group consisting of ampicillin, monohydrate; ampicillin, potassium salt; ampicillin, sesquihydrate; ampicillin, trihydrate; ampicillin, anhydrous form; ampicillin, sodium salt; ampicillin, D(-)form, L(+)form, or DL-form, in range of from 0.5% to 10% by weight of a composition, and a carrier, applied directly to affected dermal tissues, effective to treat the acne and acneiform dermal disorders, wherein the carrier includes water and a water-miscible alcohol, wherein a combined weight percent of said water and water-miscible alcohol is in a range spanning 42.2% to 99.5% of the composition. 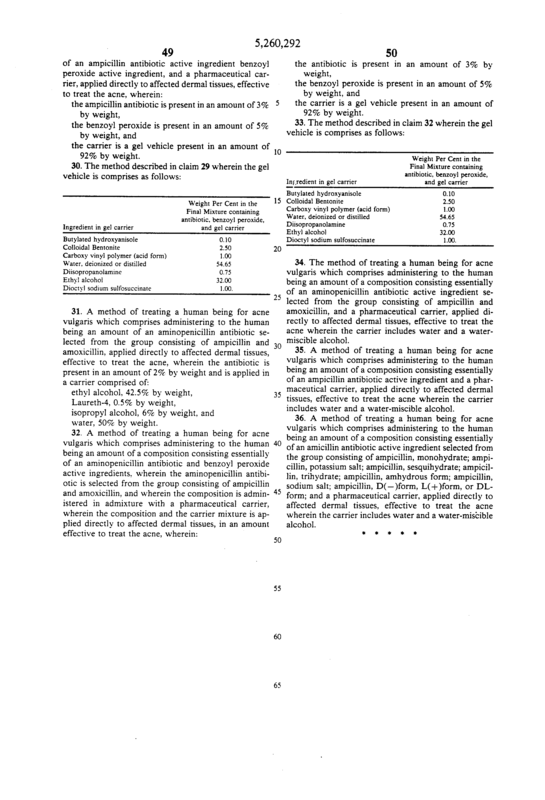 A method of treating a human being for acne vulgaris which comprises administering to the human being an amount of an anti-acne ingredient consisting essentially of an ampicillin antibiotic active ingredient, applied directly to affected dermal tissues, effective to treat the acne, wherein the antibiotic is present in a range of 0.5% to 10% by weight of a composition including a pharmaceutical carrier which includes water and a water-miscible alcohol, wherein a combined weight percent of said water and water-miscible alcohol is in a range spanning 42.2% to 99.5% of the composition. 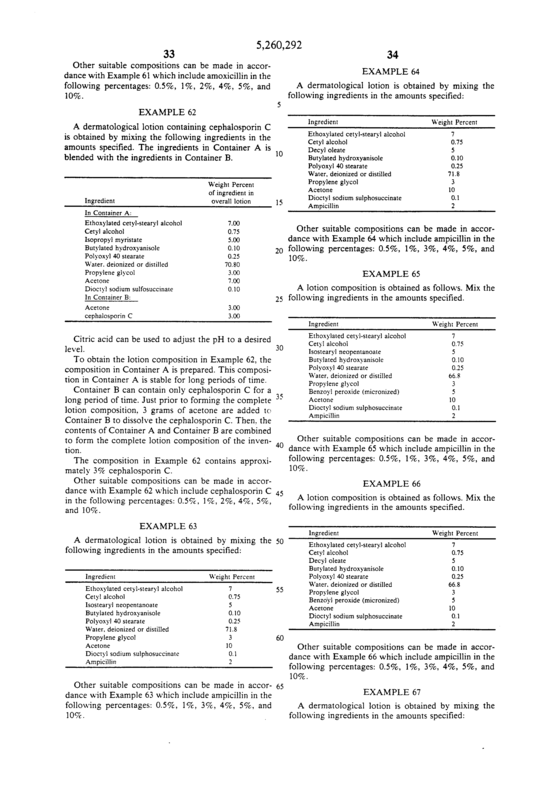 The method described in claim 20 wherein the ampicillin antibiotic is applied in a water-miscible carrier including at least two water-miscibler alcohol, wherein the sum of the weight percents of the at least two water-miscible alcohols is in a range spanning 11.2% to 90%. 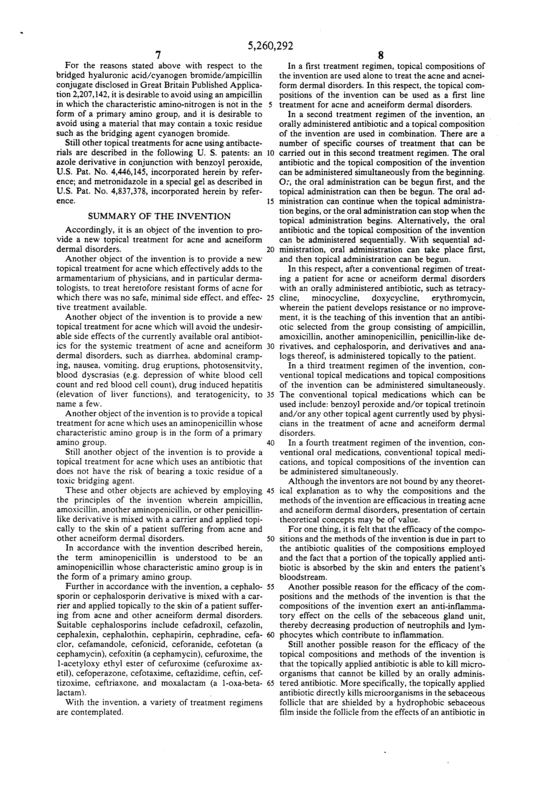 topically administering to affected dermal areas of the human being an amount of a composition consisting essentially of benzoyl peroxide and an ampicillin antibiotic active ingredients, effective to treat the acne, wherein the composition is applied in a pharmaceutical carrier which includes water and a water-miscible alcohol, wherein a combined weight percent of said water and water-miscible alcohol is in a range spanning 42.2% to 99.5%. the benzoyl peroxide is present in a range spanning 1% to 30% by weight. 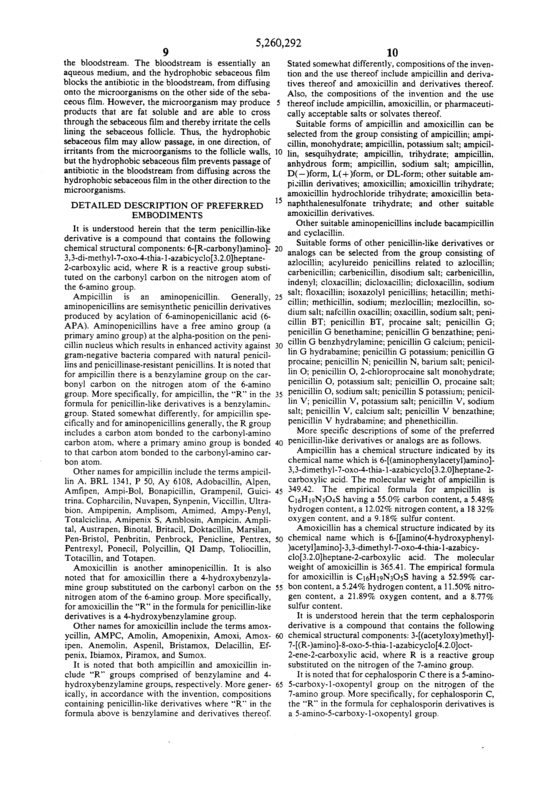 topically administering to affected dermal areas of the human being an amount of a composition consisting essentially of benzoyl peroxide and an aminopenicillin antibiotic active ingredients, wherein the aminopenicillin antibiotic is selected from the group consisting of ampicilin and amoxicillin, effective to treat the acne, wherein the composition is applied in a pharmaceutical carrier which includes water and a water-miscible alcohol, wherein a combined weight percent of said water and water-miscible alcohol is in a range spanning 42.2% to 99.5%. 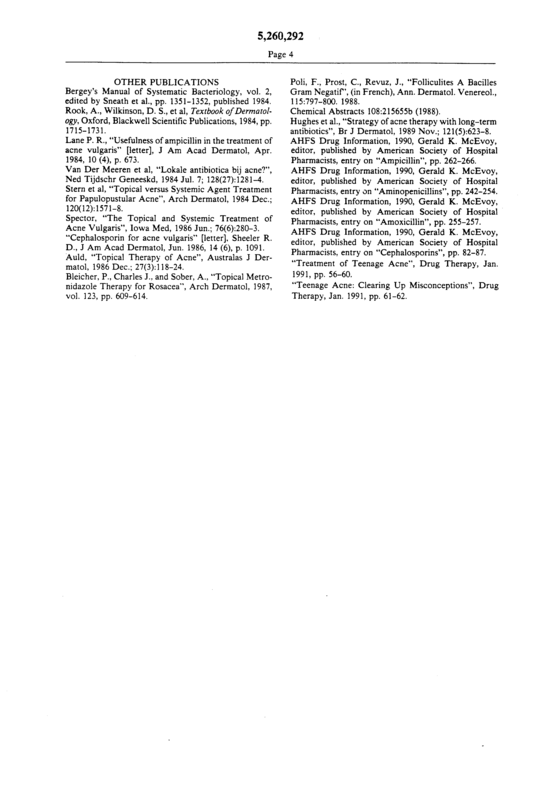 The method described in claim 25 wherein the aminopenicillin antibiotic is an ampicillin. 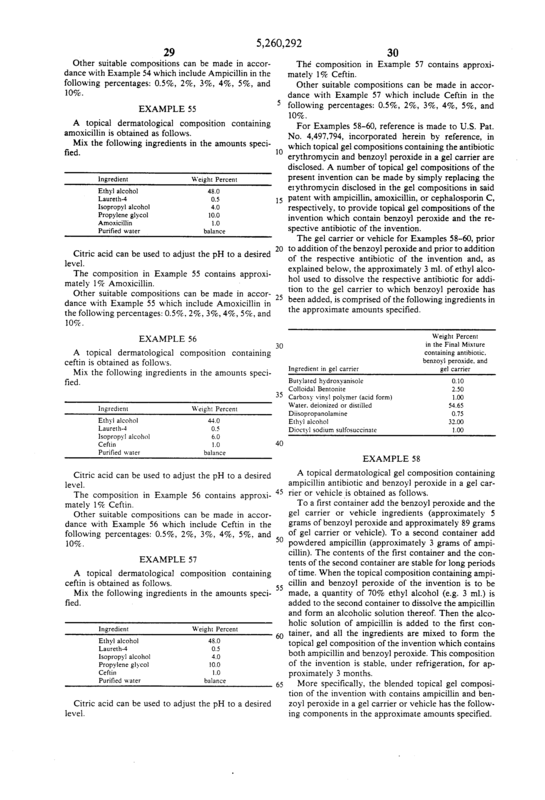 the carrier is a gel vehicle present in an amount of 92% by weight. 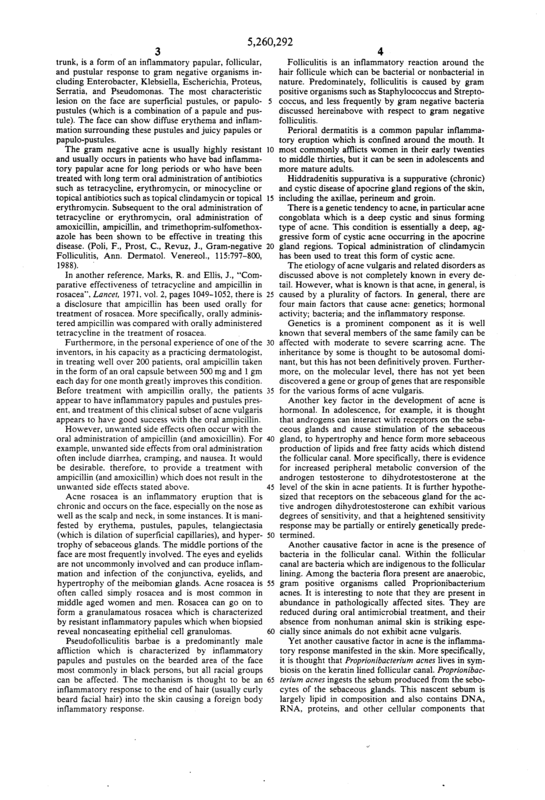 The method of treating a human being for acne vulgaris which comprises administering to the human being an amount of a composition consisting essentially of an aminopenicillin antibiotic active ingredient selected from the group consisting of ampicillin and amoxicillin, and a pharmaceutical carrier, applied directly to affected dermal tissues, effective to treat the acne wherein the carrier includes water and a water-miscible alcohol. 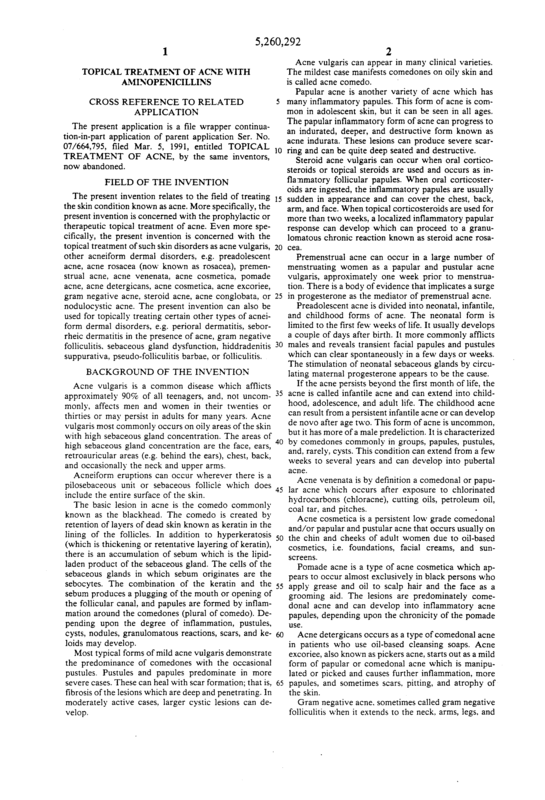 A method of treating a human being for acne vulgaris which comprises administering to the human being an amount of a composition consisting essentially of an ampicillin antibiotic active ingredient and a pharmaceutical carrier, applied directly to affected dermal tissues, effective to treat the acne wherein the carrier includes water and a water-miscible alcohol. 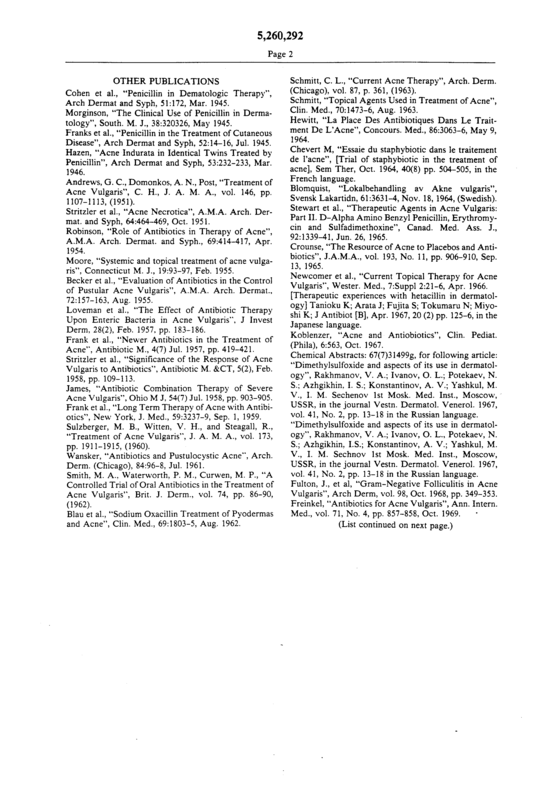 A method of treating a human being for acne vulgaris which comprises administering to the human being an amount of a composition consisting essentially of an amicillin antibiotic active ingredient selected from the group consisting of ampicillin, monohydrate; ampicillin, potassium salt; ampicillin, sesquihydrate; ampicillin, trihydrate; ampicillin, amhydrous form; ampicillin, sodium salt; ampicillin, D(-)form, L(+)form, or DL-form; and a pharmaceutical carrier, applied directly to affected dermal tissues, effective to treat the acne wherein the carrier includes water and a water-miscible alcohol.